Have you had a chance to discover all the goodies we’ve released in the last two months? Here is a recap of what has happened during February and March. Thanks to your feedback, we are polishing Quote Roller everyday and are releasing new features and functionality each week. Some of the things are minor, while others are those big long-awaited killer features you’ve been asking for. Every Wednesday is a product day at Quote Roller, where we talk about new features, designs, integrations, and other fun stuff. And what is a product day without great honest customer feedback? We want you to take a proactive approach and participate in the product development! Are we doing good, great or bad? We will continue to make updates and changes based on YOUR opinions, so tell us! Yes, they are finally here! 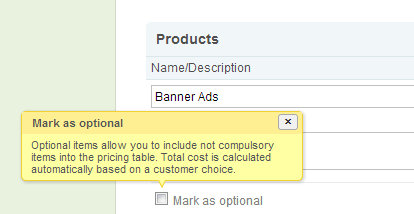 Now you can offer your customers several options of services or products to choose from. If you haven’t had a chance to try them out, you should right now! Quote Roller proposal software updates the pricing page on the fly to reflect the choices your clients have made. Isn’t it wonderful? Does your company employ a sophisticated pattern for proposals numbering? We’ve got you covered now. Head to Settings -> Company and set your own numbering format. Never lose all the hard work you’ve done! Our new autosave feature is triggered every ten seconds. If you aren’t a proposal writing champion, this time should be enough not to lose any changes. We notify you with a blue “Saving” button on the top while you are editing a template or proposal. 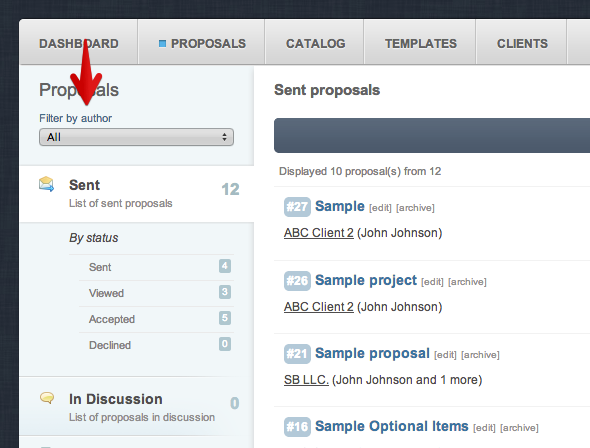 Now all the proposals can be filtered by a specific team member. It’s a great way for teams to collaborate and find a proposal they are looking for much faster. If you have an urge to do some spring cleaning or just want to test a new integration, we have introduced this feature just for you. By clicking the scary red DELETE button, you will delete all the clients without associated proposals and all the companies, that do not have clients. There is no need to test this feature, it does work. And we’ve tested it hundred times. All the contacts will be deleted with no recovery means. You have been warned. Welcome three more great apps to our ever-growing family of add-ons! Pipeline software that gets you organized. A powerful sales CRM that small teams love to use. Sage One is a series of online accounting and payroll services for small business owners and their accountants, allowing them to manage their business finances. You can activate new add-ons on your integrations page, by enabling the relevant plugins. We are adding new business proposal templates all the time, to include more sectors in our ever-growing brand and to make your proposal writing process a little easier every time. Just last week, we added proposal templates for public relations, architecture, and janitorial hires. Feel free to check back often to see what we’ve added, to add your own template to share in our library, and to refer your friends in different industries! We are so happy to have you apart of our Quote Roller family. Now, what do you think? What should be our next update?